Due to daylight savings time messing with our photo schedule, these pictures were actually taken at more like 34 1/2 weeks but it's close enough. Grayson now weighs 4 3/4 pounds - about the size of a cantaloupe - and is almost 18 inches long. His central nervous system is maturing and his lungs are continuing to mature as well. It's hard to imagine that in just over a month we will finally get to meet him. 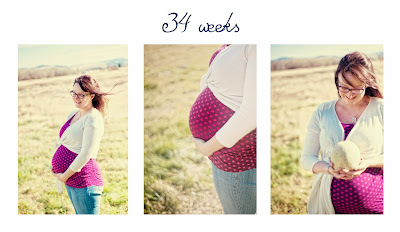 Got a little overwhelmed again this week with how much there is left to do to prepare for his arrival. Thankfully one big component got taken care of this week - the car seat. Thanks to a very generous gift from Great Aunt Mary Anne and Great Grandpa Duganz, we now have a top-of-the-line car seat to bring Grayson home in. It's a relief to know that if anything were to happen early, we would at least be able to bring him home safely. Statistically, four out of five car seats are installed incorrectly. Luckily, the local fire department is certified in child seat safety checks. So next week we'll be making an appointment to ensure our car seat is installed correctly. It's a great service to the community and I'm excited to take advantage of it.